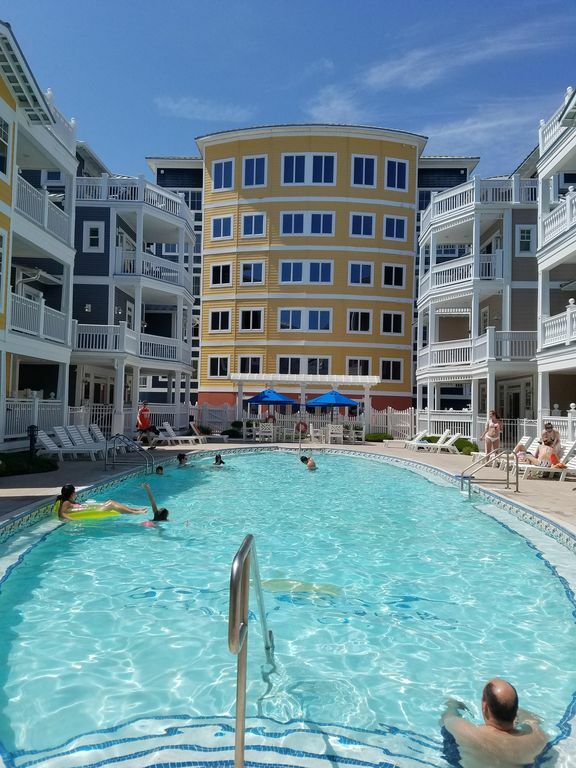 This huge 3BR/2.5Bath condo has almost 1900 sq feet of luxurious living just steps from the beautiful wide sandy beach in Wildwood Crest, NJ (voted NJ's finest beach for several years in a row by the residents of NJ). This unit sleeps 8 people very comfortably and has a king bed in the master bedroom, two twin beds in the second bedroom, two full beds in the third bedroom, and a queen sized sleeper sofa in the living room. You have a state of the art kitchen with top of the line stainless steel appliances, flat screen tvs in all rooms, full laundry room with washer and dryer inside the unit, hardwood floors, password protected private WIFI network in the unit, two reserved parking spaces under the unit at ground level, elevator, 24 hour concierge/security, and a huge private deck with with fabulous ocean and bay views. The Coastal Colors community is the premier residence in Wildwood Crest and is located beachfront. It has a private pool, private kiddie pool, and private adults only hot tub along with a huge grilling area for barbecues. There is a fitness center about 20 feet down the hall, a large game room, a library, private locked beach/pool storage area, and a meeting room for private parties. We only rent to families and mature adults over 25 years old, no smoking or pets allowed, and maximum of 8 persons. This unit is not available for prom weekends. It is available on a weekly/weekend/monthly basis in the offseason and we would rent it for the season or for an entire month in the summer if you desire. Email me for rates and for additional pictures or information. Perfect family beach vacation location. Beachfront, private access. Large private pool, separate private kiddie pool, separate private adults only hot tub large private ocean view deck Only two miles from historic Victorian Cape May World famous Wildwood Amusement Boardwalk and Piers only 5 minutes away. We couldn't have asked for more in a condo for our family trip to Wildwood. The place was very clean, spacious, and so close to so many things to do! It is literally RIGHT ON the beach, and also has a beautiful pool which is a great second option to the beach. The pool is very spacious as well, and has plenty of seating for families, along with outdoor grills available for use. The location of the place couldn't be better either, with the beach right there, the boardwalk less than 10 minutes away, and Cape May a 15 minute drive away, there is so much to do (and plenty of great places to eat as well)! All in all, I highly recommend this place as one of the premier places to stay in Wildwood for families of all sizes! We will be back, thank you! This was our second year staying at this property. We loved everything about it. From the location, the roominess and cleanliness, the amenities, like the pool and the fitness room, we couldn't ask for a better beach vacation. Relaxing week in a beautiful, spacious unit. Beautiful view. Quiet,well kept, clean. I have nothing but positive thoughts about Coastal Colors and plan in returning next year! My parents stayed with me. My dad is handicapped and wheelchair bound, but he had no trouble getting around the condo. Very spacious and accommodating. Very clean, right on the beach, with a great private pool area. Three large bedrooms and an ocean view from a huge deck. Landlord very responsive and informative. Will definitely rent this condo again. Thank you for your great review. We hope that you will return soon. This condo was spectacular!! Right off the beach plus 2 pools and a hot tub for after the beach. The kitchen is wonderfully stocked with all of the amenities you could possibly need. We thoroughly enjoyed ourselves!! Highly recommend!! Loved this condo! Less than a half block to the beach. The condo was impeccably clean, spacious, and had very comfortable beds. Great kitchen, washer/dryer, and in room wifi. Nice gym located just a few feet away on the same floor. Must be a fantastic place for a summer vacation and close to Cape May and the Wildwood boardwalk. I would definitely rent this place again. Owner was very quick to respond to questions. Thank you. Looking forward to having you as a guest in the future! No Pets allowed per the condo association. No exceptions On site Security Staff 24 hrs Personal Rental Concierge will meet you on site at checkin, orient you to the property, and is available 24/7 should you need assistance with anything related to your rental during your stay.